Kathleen Hancock, associate professor of humanities, arts and social sciences, has been honored for her mentorship of women in the field of international political economy. 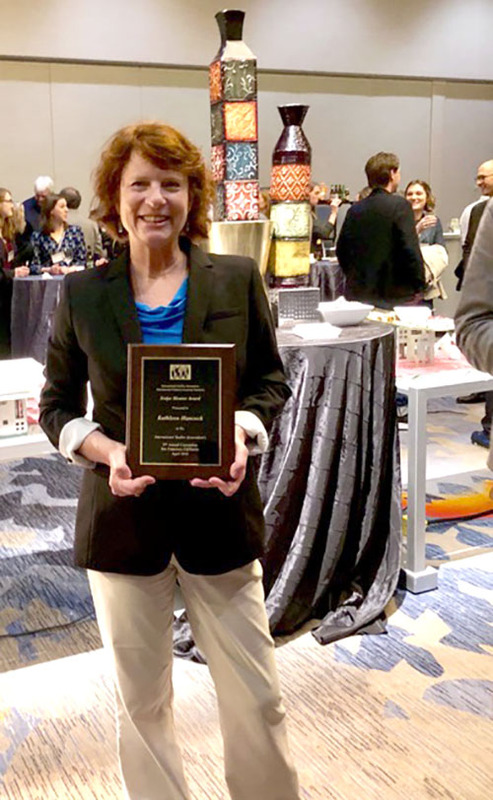 The Society for Women in International Political Economy (SWIPE) Mentor Award was presented to Hancock at the International Studies Association’s annual convention in San Francisco this April. In the early 1990s, SWIPE observed that many women in the field did not benefit from the close mentoring relationships their male counterparts enjoyed. The society established the award in 1997, and recipients have included scholars, an academic press editor and deans. SWIPE disbanded in 2009, seeing that many of its original goals had been achieved and other organizations were addressing their concerns. The award is now administered by the International Political Economy Section of the International Studies Association. A special roundtable in honor of Hancock was held at the convention. Hancock holds a PhD in political science from the University of California, San Diego, and joined Mines in 2009. She teaches undergraduate courses in international relations and is director of the master’s program in natural resources and energy policy. Hancock specializes in regional economic integration, global governance and Eurasia. Her teaching interests also include human rights.